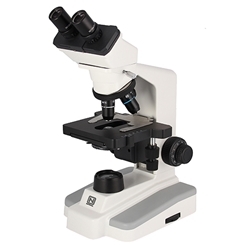 The National Optical model 168 binocular or 167 monocular high power compound microscope incorporates a wide range of features designed for university and laboratory use. Superb optical clarity and reliable mechanical engineering assure years of top performance. 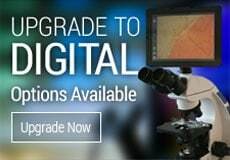 Choose from four grades of objective lenses: Standard semi-plan achromatic lenses deliver excellent clarity and normal flatness of field; ASC high contrast deliver extra image contrast; Plan achromatic for superior clarity and flatness of field; and Phase Contrast when viewing certain types of cells. Objective Lenses: DIN 4x, 10x, 40xR, 100xR (oil immersion) objectives - choose from achromatic, super high contrast, plan or phase contrast. The phase contrast system includes phase condenser and phase centering telescope. 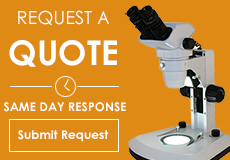 You may want to view our objective lens information page. All microscope objectives are parfocalled, parcentered and color-coded. Binocular viewing head with 30° inclined eyepieces, with dual diopters, interpupillary adjustment 54mm to 76mm, rotates 360° for easy sharing by more than one student. Quad objective turret is ball-bearing mounted for smooth, precise positioning of objectives, features textured rubber knurling for easy grip. Mounted in reverse position to facilitate ease in changing slides. Eyepieces: Widefield 10x eyepiece with 18mm field of view, supplied in both diagonal and vertical viewing tubes. Available in a monocular version as well - view model 167 here. Specimen Stage: Large 140mm x 135mm stage (5.5" x 5.25"), with professional quality, built-in, low profile, ball-bearing mounted mechanical specimen holder with low-position coaxial controls, 70mm (x) by 50mm (y) movement with graduations of 0.1mm. 1.25 N.A. Abbe condenser has rack & pinion focusing, iris diaphragm, swing-out filter holder with clear blue, green and yellow filters supplied. Focusing: Coaxial coarse and fine focusing controls, coarse has tension adjustment, fine is graduated. Illumination: 3w LED with variable rheostat control and on/off switch.110V~220V external auto-switching power supply. CE certified. Size & Weight: 7.25" x 9.25" x 16.25" high, 14 lbs.